Just do what you think you should do." This was on my page-a-day calendar Sunday. It's from a song by Bob Dylan and feels oddly appropriate right now as life transitions from one phase to the next. The other day as I sat scrolling through my phone while Jovie attempted to perform circus tricks in front of me. "Mom!" Jovie yelled. "Look at me. Watch me. You're not watching me!" And I would glance up and see she was doing something that, frankly, wasn't all that impressive, and turn back to my phone. And she would tell me I was missing it. And I would kind of agree, but not really care. "I'm looking," I'd tell her. But not really. And then Lily chimed in. "Some people look without seeing." We visited Brad's parents this weekend up at their home in the Pocono Mountains. Yesterday afternoon, I took the girls to the neighborhood playground. There's a creek that runs alongside the park, hidden among rocks and tall trees. The girls wanted to throw rocks in the water and let their feet flirt with the edges so we followed a moss covered path into the woods- all dark and cool. They crept from rock to rock on the bank, pretending to be deer. I sat on the moss and folded my legs into my chest. Watching the girls. Watching the water and the trees. The sunlight filtered through the leaves and made the water glimmer, bouncing reflections onto the surrounding tree trunks and branches in such a way that they shimmered. Like the spirits of the trees were dancing. And I felt lucky to be sitting in just that spot at just that hour because I knew this vision was temporary. That any minute the sun would drop too low or the clouds would wander in and just like that the light show would be over and the trees would go back to being trees. The water to water. Just like with the eclipse. How you have to be looking at the right time on the right day with the right eyewear and then– magic. All the things we both look at and see. These are the things that feed us. It's been five years today since I made the decision to start over-sharing on the internet. The over-sharing wasn't the initial plan when I decided to start a blog. The original plan, as I recall, was to write about the process of writing a novel while raising young children. Back in 2012 I had an almost-2-year-old and a 4-month-old and a partially written manuscript that would not stop pestering me to be finished. I thought announcing to the world (OK well, a small portion of the internet that consisted mostly of my Mom) that I was a wannabe novelist would offer up a commodity much-needed by any aspiring writer and wannabe novelist: Accountablity. I was also writing a monthly column about motherhood for my local newspaper that was under threat of being discontinued and the prospect of losing that opportunity to write was kind of devastating for me. So My Inside Voices was born. In the years since my children grew– learning to walk and talk and sing and run and write and play soccer and dance and make peanut butter & jelly sandwiches. I completed my manuscript and submitted it to literary agents (so far it's been turned down 29 times and counting). I completed a manuscript for a children's book and submitted it to literary agents (so far it's been turned down five times and counting). And that column I loved writing so much was eventually canceled. We lost two beloved cats and gained a new beloved cat (for a net loss of one cat for those keeping track) and acquired four fish (all of which have since died and been replaced multiple times over). We traded in my beloved lime green Volkswagen Beetle, made epic messes, went to the beach, went to the mountains and moved to Virginia. I took up yoga, whined about scrubbing the kitchen floor, cleaned all manners of vomit, read a story out loud to an audience of artists for the first time (and second time and third time) and flashed the interstate. In five years life happened. As it does. One hour to the next. One day to the next. One crisis to the next. One celebration to the next. While I don't like to be self congratulatory, I will say there are few hobbies in life I've kept up in life for five years running. Maybe none, in fact. Showing up here every week or every two weeks (or ... in the lean times ... every month) is something I am proud of. Not because I think I've dropped a whole lot of wisdom or worthy thoughts on to the internet (the internet already has plenty of those– I'm talking to you Parry Gripp), but because it's forced me to spend more time thinking, listening and watching. I sit with uncomfortable thoughts longer. Try to make sense of the ugly and beautiful things that happen in my own brain and in the world at large. Being able to share it here with family, friends and the odd stranger is just a bonus. My life is richer because of writing. This gift I give myself. That's important to note. Because if I had waited for someone to call me a writer before I began writing in earnest– I wouldn't have spent the past five years writing in earnest. Over the years I've learned there are no perfect conditions for listening to your inside voices, for pursuing creativity. There's no waiting for the perfect desk. For the muse to show up. For the kids to be older. For the kitchen floor to be clean. For some authority on high to give you permission. If there's something you've been wanting to do, than you just need to go and do it. There's a gravel path leading to the playground by Brad's parents house. As we were walking up the path the other day, I noticed tiny white pebbles interspersed with the dark gray gravel. I bent down to inspect and realized the white spots weren't pebbles. They were mushrooms. The littlest mushrooms ever. Dotting the gravel path all the way back up to the parking lot. Now, if I were a mushroom, I'm pretty sure my first choice for habitat would not be a hard gravel pathway. I'd probably want something softer and more shaded and more protected from giant clomping feet. But I guess you don't always get a choice in where you get to grow. You grow where you planted. You create your life where you are, as you are. 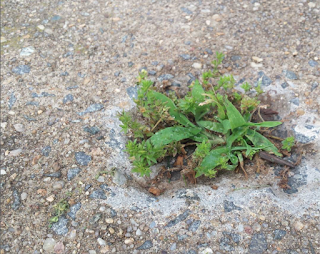 Like the itty-bitty ecosystem I found growing in a hole on a neighborhood sidewalk. Or the moss gripping the crevices of a rock. You can't wait for the right conditions to be the person you want to be. You just have to start doing it on the gravel path or in the sidewalk hole. In the midst of your small, messy life as a suburban stay-at-home mom. I think when you do that, that's when you really start seeing. You're not just looking at your life– you're seeing it. Really seeing it. The girls start school on Monday. Lily in first grade, Jovie in kindergarten. Just like that the past five years at home with both are over. I haven't quite processed what that means yet. Only that I'm not ready for the little years to be over. That my time in this intense phase of all-hands-on-deck motherhood feels too fleeting. I don't know how to do mother of two school-aged kids.I know I'll figure it out, just like I figured the other parts out. I also know that come Monday, I'll be wearing giant sunglasses and carrying a large box of tissue with me wherever I go. I'm so grateful for the chance to be their mother. To have had these years at home to watch them grow. And I'm also grateful to be a writer, which encourages me to look at my girls and see them (well, OK, except for sometimes when whatever they're doing isn't all that impressive). I'm grateful for this space, too. Which has helped me sort through so many moments of pain, fear, sadness, joy and love. So much love. And grateful for everyone whose walked by my side, reading all my long-winded rantings and musings and whatevers and offering kind words and support. I feel as if we've created our own ecosystem in a sidewalk crack for the things that break us and build us back up. It's true everything passes. Everything changes. I think what I should do is keep writing. How lucky I am to be able to see the journey.